As per a research done by ‘Industry Week’, 2000 managers out of 3000 respondents admitted that meetings waste atleast 30% of their time on a daily basis. In another research by Robert Half International, 45% of senior managers suggested that employees would be more productive if meetings are banned for atleast one day within the week. In this modern age of knowledge based work, business meetings are becoming like that necessary evil, which you can’t ignore and can’t embrace as well. Yes, meetings are important as ideas need to be shared and collaborated; feedback should be received and given; decisions must be taken. But as we have experienced earlier, more often than not, the core focus of business meetings get diluted and the result is announcement of another meeting, and another unproductive day. Here, we are sharing 5 practical ideas using which any business meeting can be made more productive and more result oriented. Yes, things won’t improve from day 1, but these practical suggestions and ideas can actually initiate a chain of positive, result oriented action plan which will help to increase productivity and motivation for all. Next time you are in a meeting, observe the person who speaks the loudest – let’s call him the loudmouth. He will put across his points in the loudest ever voice, assuming that the person who speaks loudly, speaks correctly as well. But this is hardly the truth. The person who is speaking loudly thinks that the other silent person is unprepared, ands this leads to more loud-mouthing. The person who is silent give up his attempt to speak, thinking that the loudmouth has dominated the conversation, and no will listen to him now. Both of these issues will lead to a disaster in the meeting as the core objective is not fulfilled. Ideas are not shared, and only the person with better ‘oratory’ skills gets maximum audience. The host of the meeting or the organizers should cleverly manage this loudmouth problem by giving everyone equal opportunity to talk and share their ideas. One new method called BrainWriting is gaining momentum across the corporate world, to handle the loudmouths and to make the meeting more productive. In this method, we don’t ask people to ‘speak’ their ideas, but to write them anonymously and then everyone votes on the best idea. Here, you can find more ideas related with BrainWriting. 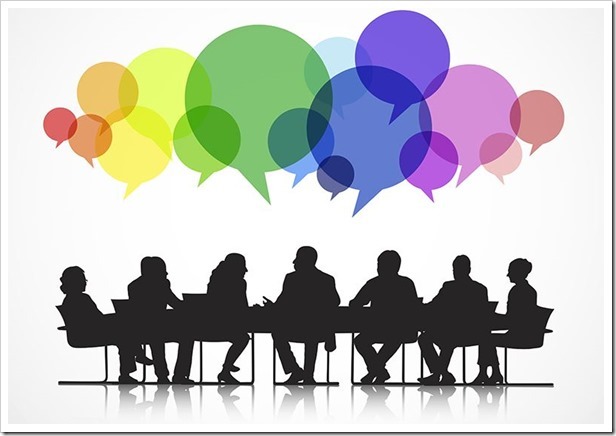 Every meetings organized has a basic problem or an issue which needs immediate attention. While organizing meetings, we write the agendas and share them with all the members present. This method of sharing agenda has been found to be unproductive, as the ‘agenda’ give birth to more agendas and soon entire focus is lost. Roger Schwarz, who is an Organizational psychologist and author of popular book: Smart Leaders, Smarter Teams have said that instead of writing the agenda, write questions. This simple method trigger a new wave of emotions in the human mind, leading him to its solutions instantly. Researchers from University of British Columbia and the University of Alberta did a research on the impact of seating arrangement on the overall thought-process of human beings, and found some interesting results. One of them is that sitting in a circle and having discussion on a particular topic among people from different background led to more harmony and co-ordination compared to people sitting in rows or columns. Among all the ideas, this is the most important one for making a meeting more productive: Having the right persons in the room. All the brainwriting and questions related to company’s growth can be stalled if there is no person to take the right decision and to take the call. Inputs, suggestions and ideas are only good if they are positively implemented, and only the decision maker can do that. For example, if the meeting is about a new product, then the produce manager who will take the final call needs to be present there, and help the meeting reach a conclusion. Amazon founder Jeff Bezos has a very interesting rule to make meetings more productive: 2 Pizza Rule, which states that, “Never have a meeting where two pizzas couldn’t feed the entire group.” Smaller the group and team, greater are the chances of earth shattering ideas emerging from the meeting. As per insiders, Jeff imposed this rule on meetings so that instead of crown dominance, individual ideas should come up, and inspire all others. What are your methods to make meetings more productive? Share your views right here!